In February 2017, the New York Post ran a story about a $325,000 wedding that was canceled after a brawl broke out at the rehearsal dinner. After a dispute over a toast led to punches, the groom’s father threatened to cut his son out of the family business if the wedding went forward. The groom then sued the bride to get back the $125,800 engagement ring. At press time, the families were still squabbling over who would pay the bills for an $1,100-a-head wedding reception that never happened. If this story has a moral, it’s that spending a lot of money on a wedding does not guarantee a happy marriage. In fact, a 2014 study by two economists at Emory University found that just the opposite seems to be true. They surveyed 3,000 men and women about their marriages and found that the couples who spent most on their weddings were most likely to end up divorced. The couple who spent over $300,000 and never even made it to the vows is just an extreme example. This study is good news for anyone who’s trying to save money on a wedding. If family, friends, or anyone else gives you a hard time about how “cheap” your plans are and tries to convince you to spend more on “the most important day of your life,” you can tell them cheaper weddings lead to longer and happier marriages – and that’s what’s really important. In the United States, weddings are big business. According to IBISWorld, in 2017 couples shelled out a total of $76 billion on wedding products and services – wedding planning, food and drink, clothes and jewelry, flowers, photos, music, and all the other frills that the wedding industry sells as “must-haves” for your big day. The industry convinces couples that this is money well spent by selling the idea that spending lots of money on a wedding – from the purchase of the engagement ring right through to the sending of embossed thank-you notes for all the expensive gifts on your wedding registry – is a proof of your love and commitment to each other. Its ads promote the idea that a pricey ring is the perfect symbol of a priceless love, and a fairy-tale wedding is the key to a happily-ever-after marriage. According to the Emory study, this is almost exactly wrong. The researchers found that in general, the couples most likely to stay married were those who spent the least on every aspect of a wedding. However, there were a couple of notable exceptions to this rule – cases in which spending more money actually gave a couple a better chance at a lasting marriage. Based on the study’s findings, here’s the dirt on what soon-to-be-married couples should do if their goal is a healthy marriage, and what they should avoid. For starters, the study shows that it’s best not to take the plunge into marriage until you’ve been dating for a while. A series of bar graphs of the study’s findings, published in The Atlantic, shows that compared to couples who had been dating less than a year, couples who had dated for one to two years before the proposal were 20% less likely to end up divorced. Couples who were together for at least three years before getting engaged reduced their risk of divorce by 39%. Unlike some of the Emory study’s other findings, this one is easy to understand. It stands to reason: If you marry someone you don’t know very well, you’re in for a lot of surprises after marriage, and not all of them will be pleasant. If you don’t learn until after the wedding that your partner snores, loves music that you can’t stand, wants lots of children when you want none, and dreams of living in an off-the-grid country cabin when you prefer the bustle of city life, you’re likely to conclude pretty quickly that the marriage was a mistake. It’s been over 300 years now since playwright William Congreve summed up this idea as, “Married in haste, we may repent at leisure.” The only difference today is that couples don’t have to spend the rest of their lives regretting a hasty marriage; instead, they usually follow it up with an equally hasty divorce. By contrast, couples who have been together for years before marriage already know the best and worst about each other, and they’ve decided the worst is nothing they can’t live with. Another unsurprising finding in the Emory study was that couples with strong religious views were less likely to get divorced. The graphs in The Atlantic show that people who attend religious services “regularly” are 46% less likely to split up with their partners than those who never do. That’s just what you would expect, since many if not most religions strongly discourage divorce. Regular churchgoers are more likely to try hard to make their marriages last. However, what’s more surprising is that this protection against divorce doesn’t apply to all churchgoers. In fact, people who attend religious services only “occasionally” are about 10% more likely to divorce than those who don’t go at all. That seems puzzling, since even couples who go to services once in a while are getting at least some exposure to their religion’s messages against divorce. In theory, those messages should make them at least a little more reluctant to get divorced than those with no religious views at all. One possible explanation is that some couples go to services only once in a while because they don’t share the same views about religion. If one partner is religious and the other isn’t – or if they belong to two different religions – they might compromise by going to services only on special occasions, such as holidays. A compromise like this could work out for some couples, but for others, their religious differences could become a strain on the marriage and eventually lead to divorce. All this is just speculation, of course. Nonetheless, it stands to reason that strong religious views will only help protect you against divorce if they’re shared. If you’re decidedly not religious, marrying someone who is means you’ll have to struggle with that difference in views for the rest of your married life. That doesn’t mean you have no chance of being happy together – but it certainly doesn’t make it any easier. If shared religious views are a good reason for getting married, there are some others that are decidedly bad. According to the Emory study, wealth and looks are two of them. As the analysis in The Atlantic shows, people who said their partner’s wealth played a significant role in their decision to get married were about 18% more likely to end up divorced. This relationship was particularly strong for women; they increased their risk of divorce by nearly 60% by marrying for money. It’s hardly surprising that people who marry for money are often disappointed. Money doesn’t always last – assuming it was ever there to begin with. A woman who falls for a man mainly because he takes her out to fancy places and buys her expensive gifts will no doubt find her ardor cooling if his business takes a turn for the worse and the flow of presents dries up. Worse still, she could discover after the wedding that the expensive lifestyle he’s been leading has left him with very little real wealth, and it’s actually a struggle just to pay all the bills they now have to share. Marrying for looks was an even bigger risk factor, increasing the risk of divorce by about 40% overall and 50% for men. Once again, the reason is pretty clear: Good looks don’t always last. If you “fell in love” with a beautiful face or a well-toned body, that love is likely to fade in the face of the natural wrinkles and weight gain that come with age. Even in those cases when money or good looks hold up over time, they’re not exactly enough to build a happy marriage on. It’s certainly a good idea to make sure you have enough money to live on before you tie the knot – but you also need to know that you have more in common than a healthy bank balance. A marriage based on shared values and goals, rather than a pretty face or a bulging billfold, is the kind of marriage that can really last. Believe it or not, a diamond ring wasn’t always considered an essential ingredient in a marriage proposal. In fact, this custom is less than 100 years old. It was started in the late 1930s by the diamond company De Beers, which eventually coined the slogan “A diamond is forever” to link the idea of buying a diamond with forging a lasting union. It also aimed to set the standard that hopeful bridegrooms-to-be should spend at least a month’s salary on a ring to symbolize their love. This campaign worked. As the BBC reports, the percentage of engagement rings containing diamonds jumped from just 10% before World War II to over 80% in 2000. In the 1980s, De Beers followed up on its success with a new campaign raising the standard for the cost of the ring from one month’s salary to two. Judging from The Knot’s Real Wedding Study for 2016, which found that the average engagement ring now costs $6,163, this campaign was pretty successful as well. However, the Emory study suggests that spending this much on an engagement ring is actually a bad way to start a long-lasting marriage. It found that couples who spent $2,000 to $4,000 on their engagement rings had a 30% greater risk of divorce than those who chose more affordable engagement rings priced between $500 and $2,000. The authors go on to suggest a possible reason why larger rings might lead to a higher risk of divorce. 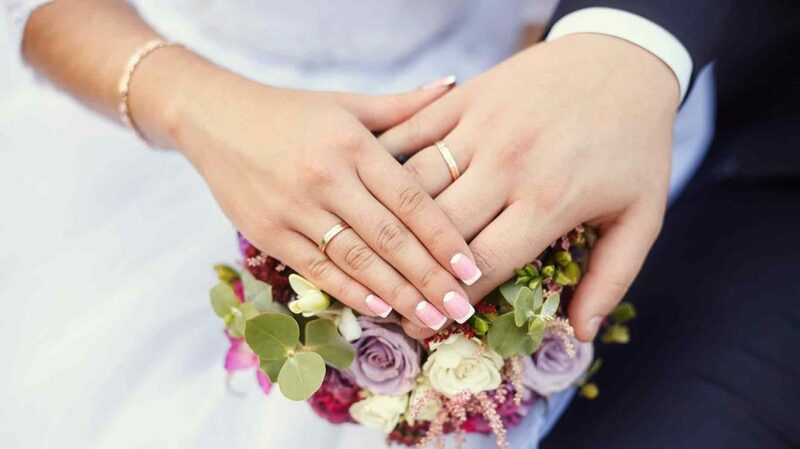 Noting that money-related stress is a major cause of divorce, the authors asked survey respondents whether the debt from their weddings had caused any stress in their marriages. Women who had been given engagement rings in the $2,000-$4,000 range were two to three times as likely to say it did as those who had less expensive rings. However, there’s an exception to the rule that smaller rings result in longer-lasting marriages. Women whose engagement rings were worth less than $500 were also slightly more likely to end up divorced than those who had rings in the $500-$2000 range. A possible reason for this is that couples who choose very inexpensive rings tend to have lower incomes. The study shows that the lower a couple’s income is when they marry, the higher their risk of divorce – likely because low-income couples are more likely to suffer from financial stress. For couples like these, it’s probably their small incomes, not their small rings, that have the most harmful effect on the marriage. The moral of the story seems to be twofold: First, don’t get married before you’re financially ready. And second, when you do, don’t choose a ring that’s going to strain your budget. According to The Wedding Report, the average cost of a wedding in the U.S. is around $25,500. However, this number is somewhat misleading, since it only takes a few super-extravagant weddings (like the one that was canceled after the rehearsal-dinner brawl) to skew the average upward. The majority of couples, The Wedding Report says, spend less than $10,000 on their weddings. Based on the Emory study, that’s a smart move. The authors found that the more couples spend on a wedding, the higher the chances are that the marriage won’t last. The graphs in The Atlantic show that couples who spend between $10,000 and $20,000 on a wedding increase their risk of divorce by 29% compared to those who spend $5,000 to $10,000. Couples who spend over $20,000 see their divorce risk rise by a whopping 46%. Moreover, unlike the findings for engagement rings, there appears to be no negative repercussions for going too cheap on your wedding. The less you spend, the lower your risk of divorce appears to be – even for a budget of $1,000 or less. Compared to the baseline couples, those who spent no more than $1,000 on their weddings actually cut their risk of divorce by roughly half. Like those who bought smaller rings, couples who had cheaper weddings suffered less stress over wedding-related debt. In fact, couples who spent less than $1,000 on their weddings cut their stress levels by over 80%. Since wedding-related debt is one of the biggest financial drawbacks of marriage, their decision to have a wedding on a budget helped these couples get their marriages off on the right foot. It also proved their ability to manage money wisely – a useful skill for any couple starting a new life together. However, reducing money stress isn’t the only benefit of having a less showy wedding. In an interview with PBS, relationship expert Pepper Schwartz says one problem with big, splashy weddings is that “the wedding has become the highlight rather than the beginning of something.” Wedding planner Kim Horn agrees, saying all the focus on wedding flowers and music distracts from “the relationship and the long-term commitment.” Couples who choose simpler weddings are putting less emphasis on the big day and more on the marriage to come. Many couples looking to save on wedding expenses focus on keeping the guest list as small as possible. After all, inviting fewer people allows you to choose a smaller wedding venue and spend less on food and drink for the reception. Kerry L. Taylor, who blogs as Squawkfox, brags that she kept the cost of her 2011 wedding below $600 by “ruthlessly” cutting the guest list, limiting it to local friends and family members who had invited them over for dinner at least once in the past year. However, the Emory report suggests that this is actually the worst way to save on your wedding if your goal is building a marriage that will last. It found that while cheaper weddings were more likely to lead to stable marriages, smaller weddings did not. Couples who married by themselves, with no guests at all, had the highest risk of divorce. Compared to them, couples who invited between 10 and 50 guests cut their risk of divorce by roughly half, and those who invited over 100 guests reduced the risk even more. At first glance, it seems puzzling that bigger guest lists reduce the risk of divorce when pricier weddings do just the opposite. However, there are a couple of reasons this could be the case. For one, couples who marry in front of a big crowd of people have made their commitment highly public, so they may feel more pressure to stay together. Also, inviting lots of people to their wedding is a sign that they have a large social network, and therefore have plenty of people to turn to for support in tough times. Another way to save on a wedding is to cut out as many of the frills as possible. Many couples have cut hundreds or even thousands from their wedding budgets by choosing a nontraditional wedding dress, using a private car instead of a limo, or skipping the band and DJ in favor of a smartphone and a speaker. However, according to the Emory study, there’s one wedding expense you shouldn’t skip: the honeymoon. Couples who went on a honeymoon of any kind had a much lower risk of divorce than couples who didn’t. The study found it made no difference how much the couple spent on the trip; a honeymoon on a budget – such as a road trip or a cozy weekend getaway – had the same benefit as a month-long cruise in the Caribbean. What mattered was that the couple started off the marriage with time to themselves, away from the pressures of daily life. The authors of the study don’t speculate about why going on a honeymoon helps a marriage last. One possibility is that it sets a good precedent for married life by showing the couple how important it is to make time for each other. Couples who make a point of taking time to connect – for instance, by going on regular date nights, even if they’re inexpensive dates – are less likely to grow apart over the years. Overall, it appears that if you want your wedding to be the start of a long and happy marriage, the best kind of wedding to plan is big but not fancy. It’s much better to invite all the people you care about, even if all you can feed them is cake and punch, than to serve filet mignon to a handful of people in a swanky hotel. Feel free to skimp on the ring, the flowers, the music, or the food, but not on the guest list. And while you’re setting the budget, remember to save some of your dollars for a honeymoon. Of course, it’s one thing to know why you should have a less expensive wedding; the tricky part is figuring out how. Fortunately, Money Crashers has lots of articles to help. In our marriage archive, you’ll find loads of articles packed with tips for saving on wedding photography, receptions, centerpieces, music, and more. They’ll help you have the wedding of your dreams on a real-life budget – and have enough left over to live happily ever after. Married readers, how much did you spend on your wedding? Do you think you made the right choices?